Occasionally all of us will have an “Oops” moment when we spill something on our cherished wool or silk rug and go into panic mode. 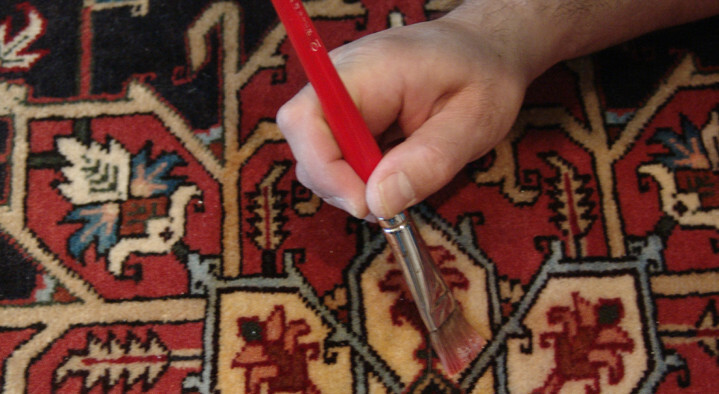 When you have a stain on your Oriental, wool or silk area rug it’s imperative the appropriate spotting solutions are used to avoid any permanent damage to your rug’s fibers. Most over the counter remedies don’t work and in-fact can easily set the very stain you are trying to remove. The sooner you treat a stain the greater likelihood you can prevent permanent damage to your Oriental, wool or silk rug. In case of a food spill or urine on a rug, the problem is more easily handled if the spot is treated promptly before the spill is allowed to dry. Blot up as much liquid as possible with paper towels or a clean, white cloth. Try to rinse out as much of the spill as possible by dabbing the affected area with a moist cloth towel (white) or paper towel. NEVER scrub the fibers of a wool or silk area rug. Too much manipulation of the pile can spread the stain and damage the rug’s fibers. Finally, sponge the area with cool, clean water to finish. Use absorbent towels or a firm, non-shedding sponge. Don’t use a brush so stiff that it pulls fibers from the pile. Don’t scrub hard at the pile. Sponge in the direction of the nap. Place some towels under the spot to keep floor or pad from getting wet. Dry thoroughly. When the nap feels dry, check the back of the rug to be sure the area is completely dry. Oriental, wool and silk area rugs will last many generations if cared for properly. If you are unable to remove a stain or do not feel comfortable trying you can give us a call anytime, day or night, seven days a week and we will be happy to walk you through the treatment process or schedule a pick up and take care of your rug cleaning or stain removal needs at our plant. Oriental Rug Salon’s rug cleaning professionals are specialists in removing stains and that’s why our services are relied upon by many of our areas leading interior designers, insurance companies, contractors and homeowners when an expert is needed to clean, treat or repair a treasured area rug. With years of experience, our services are also relied upon or referred by floor covering specialists and carpet cleaning companies to their customers who are in need of a quality Oriental, wool or silk area rug cleaning company. Berries, blood, cherry, chocolate, coffee, colas, crayon, dried blood, excrement, glue, grape, grass, grease, gum, ice cream, ink, iodine, jelly, latex paint, lipstick, milk, mud, mustard, nail polish, oil, olive oil, pet, pomegranate, purple juice, red juice, red wine, rust, soda, spills, strawberry, tea, tomato sauce, urine, vomit, wax and wine.